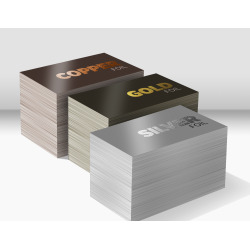 Our Foil Stamped Business Cards include full color printing both sides with a Gold, Silver or bronze Foil Stamp on one side printed on 16 point heavy stock with a silk finish. Boost your confidence and professionalism with our color business cards. Foil Stamped There is 1 product.